February 25, 2015 – Continental Motors Group (CMG), an AVIC International Corporation company, announces that the IO-360-AF (alternative fuel) engine model received type certification from the FAA in January 2015. The 6-cylinder IO360-AF is certified for standard 100LL as well as unleaded 91UL avgas now available in several countries. 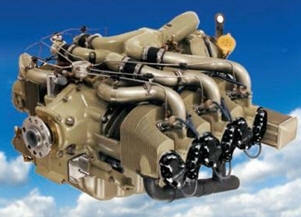 Flight Design, GmbH is expected to take delivery of the first certified engine in Quarter 2, 2015. The IO-360-AF is the first in its class to be certified for alternative fuels benefitting certain markets where 100LL avgas is relatively expensive and with the expanding availability of 91UL. Beyond the alternative fuel advantage, the IO-360 series has an excellent reputation for reliability, long life and smooth operation. It is the lightest of all Continental’s six-cylinder aircraft power plants making it a perfect solution for the new Flight Design C4 carbon, 4-seat aircraft. The IO-360-AF engine family offers a maximum power output of 195 horsepower at 2800 RPM, a 2,200 hour Time Between Overhaul (TBO) and is backed by Continental’s industry leading warranty and service support. Flight Design will use the IO-360-AF engine de-rated to 180 horsepower as required for the C4, producing power at a reduced 2550 RPM, resulting in quieter operation. “Our engineering team has worked diligently to move the IO-360-AF from opportunity to reality; and we are very excited to have it certified, meeting the needs of our customers,” stated Rhett Ross, Vice President, AVIC International and Director, Continental Motors Group. “The IO-360-AF is a nice addition to our fuels capabilities and further demonstrates our ongoing commitment to advancing technology” continued Ross. “We are very pleased with the close cooperation we have received from Continental Motors on the C4 project,” said Matthias Betsch, CEO, Flight Design GmbH. The IO-360-AF Type Certification brings us another step closer to realizing our vision for the C4 light-sport aircraft”, continued Betsch.